Artist Chris Ovdiyenko has created a series of modern hobo nickels based on "some of the most iconic coins," imagining what they would look like if they were overengraved by someone with a delightfully morbid sensibility. He's fully funded and has unlocked a lot of high-ticket stretch goals. The coins start at $14, and he's successfully shipped three other kickstarters -- all custom decks of cards -- and, in another guise, was responsible for these amazing coins (which I own! ), so he seems like a good bet for your crowdfunding dollars. Arguably the most beautiful coin ever produced, the U.S. Peace Dollar was originally produced to commemorate the peace that followed World War One. My rendition features a skull portrait (keeping the radiant crown) on the front (obverse), and two skeletal hands breaking a rifle on the back (reverse). Interesting to note that the ‘broken rifle’ was abstracted into the Peace Symbol we know today. Rest in Peace! Aged with an antique silver-finish. As with all the coins, this is a 39mm die-struck, hefty 12 gauge coin. My take on the classic buffalo nickel hobo coin (popular because it was a ‘soft’ coin to carve), features a skeleton Chief with a no-nonsense attitude on the front, and an intricately carved buffalo skeleton on the back. Aged with an antique silver-finish. As with all the coins, this is a 39mm die-struck, hefty 12 gauge coin. Scares the sh*t outta me—and that’s a good thing! Based on what is considered one the most beautiful coins of all time, the Walking Liberty Dollar. Front side (obverse) features a grim reaper you never want to meet, and the back of the coin shows a Poe-esque scene with a raven. Nevermore! Aged with an antique silver-finish. As with all the coins, this is a 39mm die-struck, hefty 12 gauge coin. Even hobos like a drink! 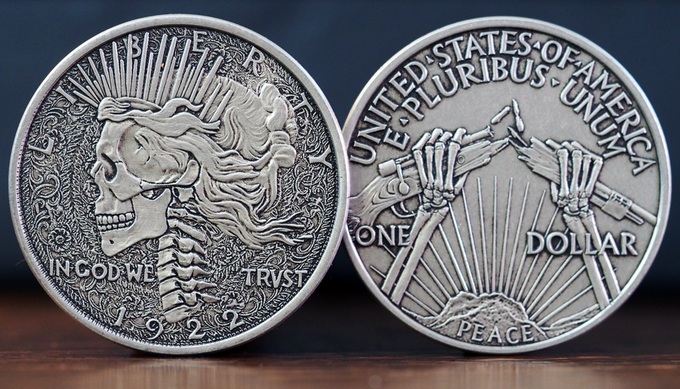 The front face (obverse) of the coin features a hobo skeleton enjoying a pint. The back side (reverse) shows a skeleton hobo chilling in a box car with his loyal dog companion. Aged with an antique silver-finish. As with all the coins, this is a 39mm die-struck, hefty 12 gauge coin.